My foodie roots firmly established themselves when I was quite young, and my father and I would watch Yan Can Cook , The Frugal Gourmet, or Julia Child, the OG’s, Original Gourmets, of Food Television before he entered the kitchen to create a random concoction that none of us had ever, or would ever eat again. I still to this day carry on that tradition when I cook by throwing caution to the wind and mixing flavors together based off an idea not a recipe. 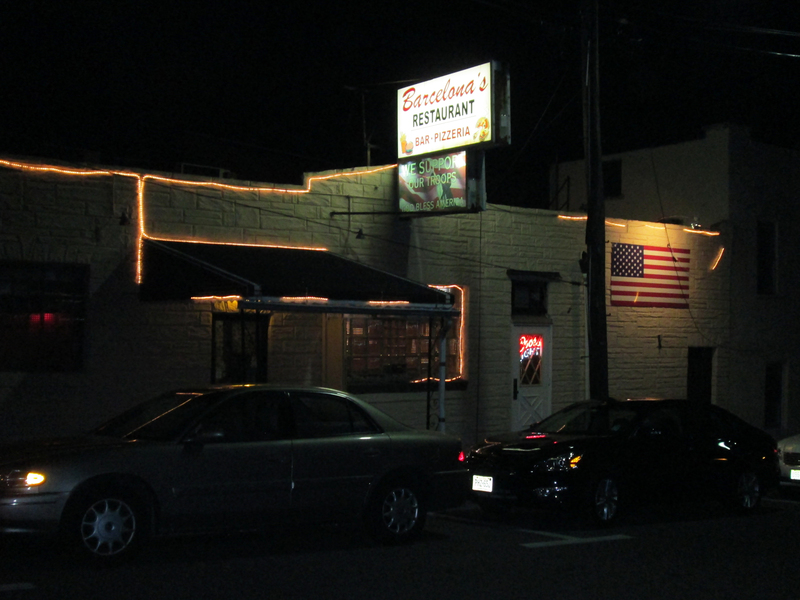 It was not only these pre-pubescent culinary kitchen escapades that lured me into the sordid realm of the epicurean, it was also the local eateries that my family would journey to when my parents could scape together enough spare cash. Since saving money was always a concern, we never ventured to places that would be considered gourmet by the one-percenters, but through the rose colored glasses of a child, the places we went were enchanted. Still to this day I am drawn to establishments that harness that old world, blue collar charm that I covet, like Twitter followers are flocking to Sir Patrick Stewarts amazing tweets . 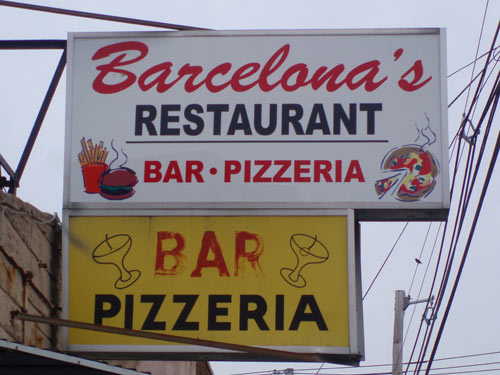 Places like Dp’s in Garfield, Pub 199 in Mount Arlington and of course Barcelona’s Restaurant and Bar located at 38 Harrison Ave, in Garfield, NJ, have a certain, “je ne sais quoi” that people that would normally punch people for saying things like, je ne sais quoi, absolutely love. When you pull up to a restaurant such as Barcelona’s, you may feel as if you just exited a police call box that is bigger on the inside than it is on the outside with a Doctor that shares a name with a famous first baseman. In other words, restaurants like these are a blast from the past, before decorators were hired to build business, television shows praised dives, and social media marketing firms spread your name, these mom and pop shops survived on word of mouth advertising, quality food at a fair price, and a wait staff that made you feel as if you were home. As you enter Barcelona’s, you will be greeted by one of the welcoming employees that will seat you in the dining area or point you to the bar. 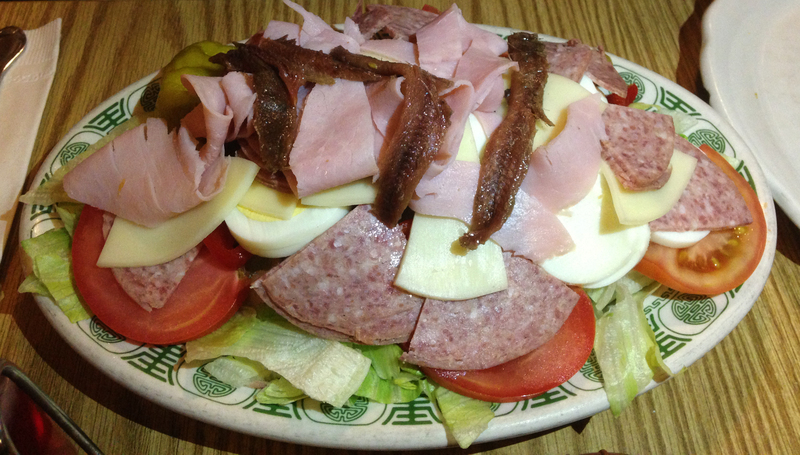 Once you are seated in your region of choice, you will be given their famous and extensive menu, that if you are anything like me will take you quite some time to peruse. Fortunately for us, who make food decisions slower than a 14.4k modem was able to download a naughty picture, Barcelona’s offers a full wine, beer, and cocktail menu in order to assist you in passing the decision making time. On my last visit to this nostalgic land of foodie goodness, I brought my parents out, along with my wife to celebrate my Father’s birthday. We won’t say how old he is, but we will say that when he was born the Dodgers still played in Brooklyn, the Lakers in Minneapolis, and Harry S. Truman was eating Cornmeal Dumplings with Turnip Greens in the White House. At Barcelona’s it is not uncommon to see several generations of families huddled around a table pontificating and politicking while breaking bread together, as if it was the old days and we were no different on this occasion. 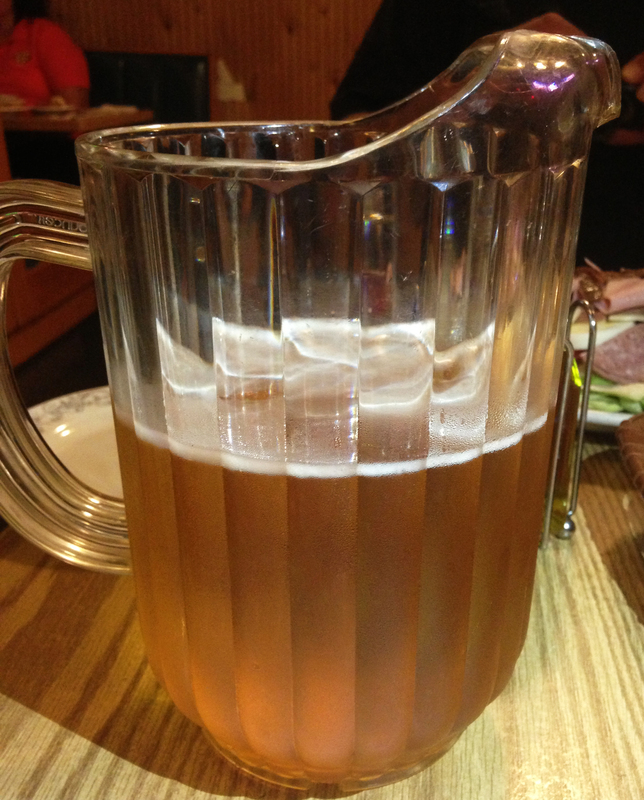 Nothing washes down great food like a cheap pitcher o’ beer. As we sipped our cocktails, we meticulously read the menu as if the perfect item was going to leap off the page at our taste buds. To be honest though, I have never had anything that was sub-par at Barcelona’s, so I could technically close my eyes and play pin the fork on the menu game and be satisfied, but where is the fun in that. Since my mother and my wife were giving me the same death stare which regardless of the translation made every single hair on the back of my neck stand at attention, I decided that my time with the menu had come to an end, and it was time to make my final decision. As always, I deferred to ordering last to give me that last 30 seconds to make up my mind. While I was scanning the menu faster than Dr. Sheldon Cooper can read a comic, my mother ordered the Spinach Ravioli, Kat ordered Chicken “Italian Style,” and my father ordered an Antipasto Salad, a small Sausage Pizza, and an order of mussels… and you wondered where I get my appetite from. 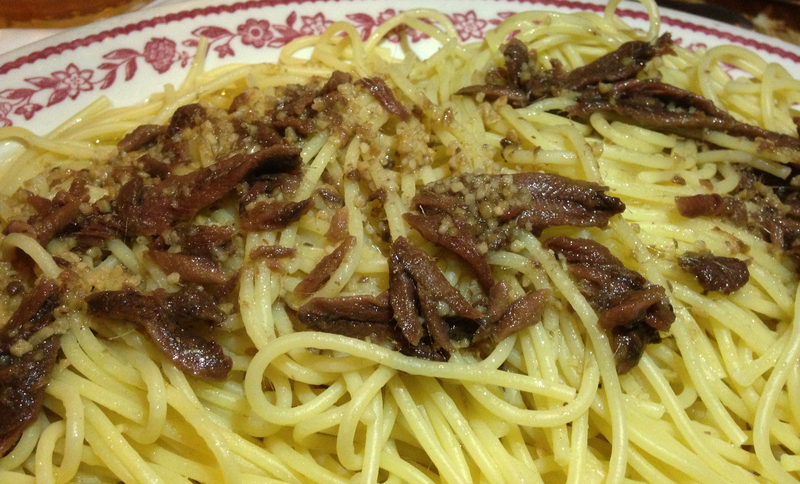 With reckless abandon, I spewed forth my order, which consisted of a plate of mussels and Spaghetti with Anchovy Sauce. As we discussed the world outside Barcelona’s from the friendly confines of this welcomed time warp, we all felt at ease. Kat was not even playing Candy Crush at the dinner table, perhaps due to some sort of anti-technology force field that Barcelona’s emits from their kitchen, but it was a nice change of pace. While we were all immersed in conversation, our food began to arrive at our table. The portion size compared to the price was all sorts of preposterous, and that is just how I like it. 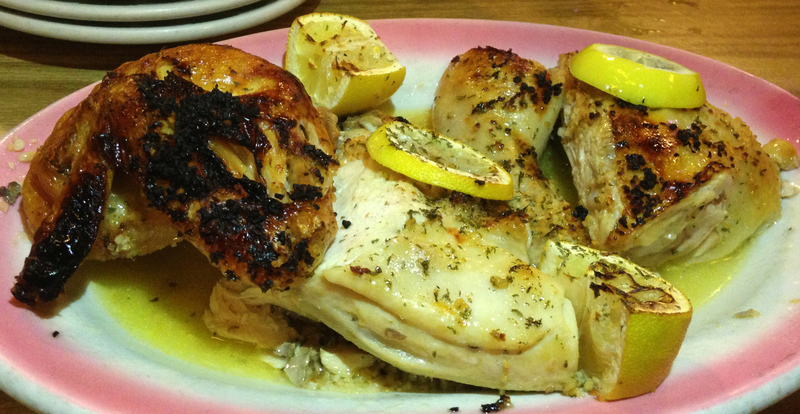 As we partook in what always tastes like a home cooked meal at Barcelona’s, we all just smiled and chewed. Not liking this pizza is downright UnAmerican! If you are a Barcelona’s virgin, I highly recommend at least sampling the thin crust pizza that has become somewhat famous in the area. 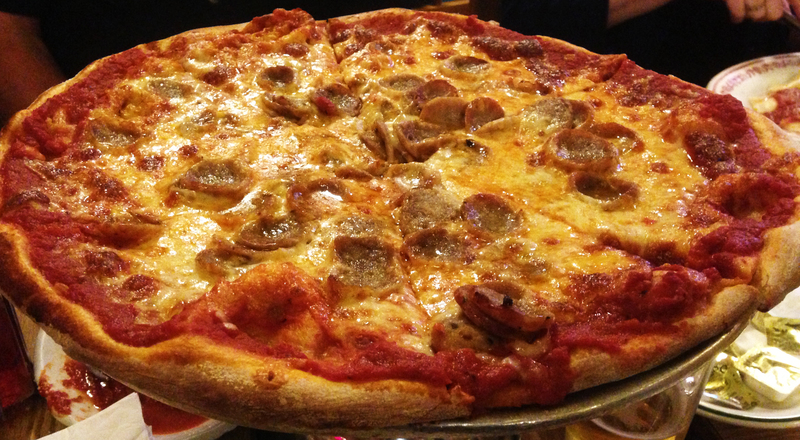 The sauce is downright delightful, the cheese is of the utmost quality, and the home made dough is the perfect texture. I also always recommend trying one of the many pasta dishes that Barcelona’s has to offer, as they are an Italian restaurant at heart, and every pasta dish I have ever tried has been simply delicious. My pasta with Anchovy Sauce was not the exception to this rule either, the expertly cooked, Al dente, pasta paired with the salty goodness, TWSS, of the sauce was flawless. To add to the wonderfulness of my meal, the mussels that I ordered were larger than most and extremely tender. Barcelona’s knows Pasta like Bo knows well everything! The décor and the sentimentality of Barcelona’s is not the only thing that is circa 1970’s dining, the prices are as well. This family owned and operated eatery is still a place that an entire household can come to and find something to eat at an affordable and fair price. For over 74 years Barcelona’s of Garfield has been serving North Jersey families as if they were part of their own. Every time I have entered this legendary blue collar eatery, I have not only been satisfied with the meal, but my wallet has left a lot heavier than it would have if we ate at any of the newfangled restaurants that pride themselves on razz ma tazz instead of tradition. Don’t get me wrong, I love me some razz ma tazz as much as every employer that has ever watched Barney Stinson’s video resume, but sometimes all I want is large quantities of magnificent food served at a reasonable price, sans the flair, and that is why I love dining at places like Barcelona’s. Note: Barcelona’s technology defeating force field apparently works on credit card machines as well, so when you venture to this all American old school Italian joint make sure to bring your Benjamins. Although, they were nice enough to find an ATM that is equipped with an anti-technology nullifier for your convenience, which is located on site.